An original later printing from around 1978 in the bronw paperback classic style. No writings. 2 Wigginton, Eliot Foxfire 2; Ghost Stories, Spring Wild Plant Foods, Spinning and Weaving . . . Etc. A classic copy of the second Foxfire book with the brown colored covers . A 6th printing from the 70's. Has a one line previous owner's name stamp inisde front cover and looks age-toned on the spine and has light wear on the cover. The contents are very good and it is a tight copy that should last many many more years. A used book. 3 Wigginton, Eliot - Editor Foxfire 2; Ghost Stories, Spring Wild Plant Foods, Spinning and Weaving . . . Etc. Third printing of Foxfire 2 in the older version full brown white lettering covers. Looks like a used copy but is in good tight shape. 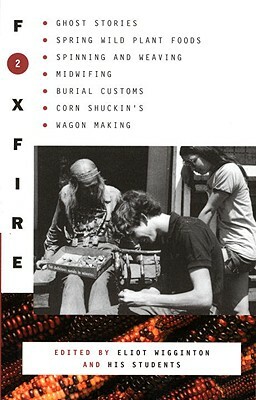 4 Wigginton, Eliot - Editor The Foxfire Book; Hog Dressing, Log Cabin Building, Mountain Crafts . . Etc..
An old 1972 10th printing with the older version full white covers and brown lettering. Looks like a well-used copy but is in good tight shape.